Oh. My. Look at that! We're not really "beef roast" people, usually opting for steaks instead. At least, we've tried roasting hunks of beef and it never gave us the same satisfaction. Except, of course, for prime rib. We've roasted prime rib at home several times before, and they were always delicious, even if we didn't always cook them perfectly. But, of course, for such a huge hunk of beef and at its expense (I can barely get myself to buy it! ), I thought we should come up with a fool-proof prime rib technique. I was going through my blog reader a while back and saw a post from Chef John of Food Wishes Video Recipes titled Perfect Prime Rib of Beef with the Mysterious "Method X". Needless to say, I was very intrigued. So, what is Method X? 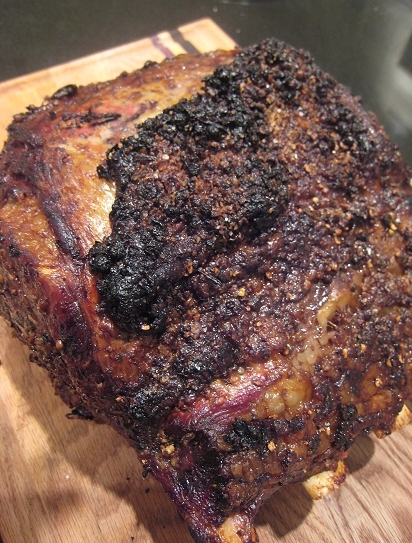 Method X is used for bone-in prime rib roasts that you want to cook to medium-rare. It works for any size. However, using boneless prime rib roasts has not been tested, nor has changing the doneness. First thing, the prime rib roast must be brought to room temperature. 6 hours was the time allotted for this. However, we couldn't be home early enough for that, so I only had ours out on the counter for 2 hours or so (and hoped that it would be all right). For seasoning, we simply did salt and pepper. Anything works. Before putting the roast into the oven, I preheated the oven to 500F. Next, some math. See, one really does need math out of school! Take the weight of the hunk o' beef in pounds and multiply it by 5. Ours was 8 pounds, so the resulting number was 40. This number is the number of minutes that the prime rib cooks for in the 500F oven. So, we put our prime rib roast into the oven and let it cook at 500F for 40 minutes. Then, after that time is up, one turns off the oven and does not open the oven door for 2 hours. After the 2 hours, pull out your meat. I don't even know if it needs to rest because essentially, it's been "resting" all this time. But, I let ours rest for a bit. 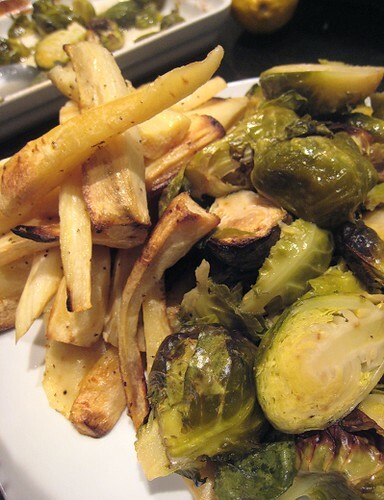 We wanted to keep the sides simple, so we roasted off some brussels sprouts and parsnips. As you can see, the prime rib had a very nice crust. How about the interior? 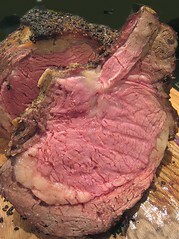 Well, as I was slicing the prime rib, I couldn't help but exclaim out loud with EACH slice: "Ooooh! Wow! It's soooooo juicy!" That prime rib looks perfect! And soooo simple. I wouldn't need anything else either. I've never tried making it myself. Too expensive vs. too much worry about messing up an expensive cut of beef. Wow! That looks great!! That Chef John sure is good, and quite handsome as well. I'm a big fan. Holy Smokes! You cooked your prime rib PERFECTLY! Holy Frig. That looks awesome. You're first sentence was the first words out of my mouth when I saw that. Awesome (the meat..the roast...you get the idea). I'm salivating at the look of this Prime Rib...perfectly done. You certainly make a good argument for trying this method out. I've never attempted a prime rib, but if I ever do, I'm using Method x! That is a serious piece of meat. There is a talent to getting it right, and you definitely got it right on the money. Impressive! I have to try your method! Method X looks pretty awesome. This rare meat used to scare me in the past, but now I really love it! this looks amazing. i'm really trying to cut down on my red meat intake, but when i see pieces like this, i really rethink y even bother! do you know i've never, ever considered making prime rib at home. this post is getting me to seriously reconsider. it's perfectly cooked. and it doesn't need to remind us all of some rubbery, uber-fatty piece of $8.99 special at the local diner. Ooh thanks! I'm going to try this. I love juicy medium rare meat! Yum! Oh man that looks incredible! Thanks for sharing the "method". I've never tried making PR at home because 1) it seemed to complicated and 2) it doesn't come in 2 person sizes. I think I just need to have a dinner party and invite people over. Oh. My. God. That looks absolutely ravishing. Before trying it out, I was both optimistic and scared. I'm sold now. That medium rare meat was soooo juicy! Haha... yeah. I know we're all supposed to eat more fruits and vegetables. But hey, this is an occasional splurge (both tummy-wise and wallet-wise). Prime is the only "roast" I like, I think. Otherwise, I just got for a teak if I need a beef fix. Would love to hear how it turns out for you! Oh man that looks incredible! Drooling is always a good sign. You don't know me but I'm in love with you. It was salivate at first sight. May I take you to dinner, if I pick you up at seven would you be rare, I mean ready? I make prime year for my family ever year for Christmas, and the Method X method is the one I have ALWAYS used. It's stupid easy and it renders the most beautiful piece of meat you could ever imagine sinking your teeth into. Perfecto! 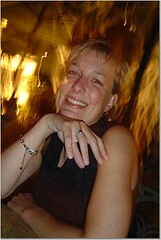 I was quite happy to have discovered it as well! Mmm, prime rib!